If Safari perceives a readable article on the page you are viewing, the Reader button is active in the Search and Address field, and you have the option to open the article in Reader. Safari aims to be elegant and clutter-free, so Reader removes all the ads, buttons, bells, and whistles from the web page and shows you only the article as one continuous page. Even the scroll bar appears only when you hover the mouse pointer near the edge of the Reader “page,” as shown. Click the Safari icon on the Dock or Launchpad. Type in the URL for the website you want to visit. For example, you might visit The New Yorker at www.newyorker.com. Click the article you want to read. You see the article with various advertisements, banners, photos, links, and so on. 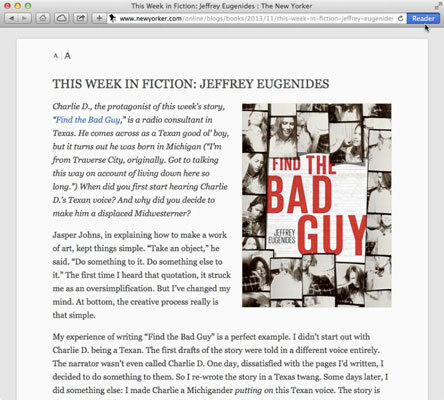 Click the Reader button or choose View→Show Reader. If the article runs over several pages, Reader displays it as one continuous page so you need only scroll down, not click from one page to the next. If you need to adjust the size of the text, click the type buttons (the two A’s) in the upper-left corner. To exit Reader, click the Reader button, choose View→Hide Reader. Or press the Esc key to exit Reader and return to the normal Safari view of the article. Click the Back button to return to the original site. In both Reader and normal Safari view, press ⌘+= or ⌘+– to zoom in or out on the text. If you have a Magic Mouse or Trackpad or a MacBook that recognizes multitouch gestures, you can also pinch in or out to zoom.